Clever Icelandic entrepreneurs have turned the waters of the Blue Lagoon ― a big, blue, more or less natural, hot pool ― into an elaborate, expensive, obligatory tourist attraction. It was fine it the summer but really great in the winter. 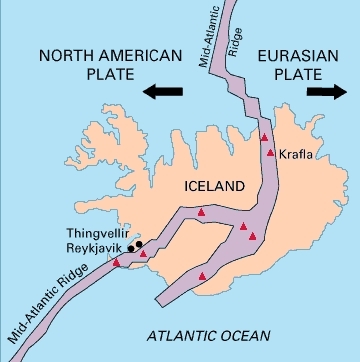 Iceland is geologically in both Europe and North America. 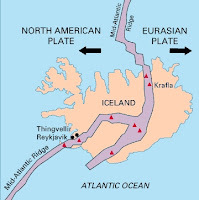 Sitting on that intercontinental rift, Iceland is being slowly split as the part on the American tectonic plate separates from part on the European plate. Consequently, the island is a geology textbook come to life with volcanoes, glaciers, volcanoes underneath glaciers, fissures, waterfalls, bizarre erosion, geysers, boiling mud, hot springs, other geothermal phenomena, you name it. I focused first on Reykjavik, then (in a rental car) drove around the desolate, thinly populated western peninsula, and finally saw the more famous natural wonders in the south and southwest. Overall, despite cold, often overcast days (not the dream August sun), I thoroughly enjoyed Iceland. While its famous geology was nice, what I liked most were the rugged and wide-open spaces ― and the friendly and open people. Locals and visitors taking advantage of a crisp, sunny August afternoon. Big Lutheran church with the unusual tower sits on the highest city hilltop. Two out of three were flirtatious women who refused to tell me the occasion. The Alþingi (aka Althing, with "th" for Iceland's unique letter "þ"first met here in 930. Icelanders claim it as the "world's oldest parliament." But, sorry, it only assembled chieftains (not elected representatives) nor has it met continuously since 930. Alþingi conclaves were held at this key site on the intercontinental rift, now in Þingvellir National Park. These photos are from the stunning and stark Snæfellsnes peninsula where you drive for miles without seeing a house or car ― and rarely horses or sheep. Icelandic horses are a somewhat small, strong, handsome, muscular breed. A surprising number of herds were seen around the island. They are used for competitions, for tourists to ride, for farm work, and sold for horse meat. Speaking of eating horses, what about whale? After a two-year break, whale hunting recommenced around Iceland this summer. Driving by the main plant in Hvalfjörður, in the distance we saw whale carcases being butchered. On this emotional subject, defenders claim that the quota of a few hundred each year is highly sustainable given 40,000 minke whales and 20,000 fin whales in Icelandic waters. Local opponents reply here and here. Iceland's coast is a rugged mix of craggy, jagged, gray-black cliffs and rocky jet-black beaches, sometimes broken by especially striking configurations. Iceland's rain, snow, and glaciers produce many beautiful waterfalls. Some of the most famous ones are in the southern part of the island. To the right is the Hraunfossar waterfall which emerge seemingly out of nowhere (actually via old lava channels). Seljalandsfoss (left; 40 meters high); even more spectacular Skógafoss (60 meters high). On the dark, drizzly day I visited the huge two-tiered Gullfoss, I could not get an ideal photo, but in terms of power, scale, and drama, this is one of the world's greatest waterfalls. A real geyser kicks up the geothermal show quite a bit. The geyser named Geysir offers the most reliable phenom. However, I don't understand the fuss over a little steam coming out of the ground with a few little bubbling mud puddles on the side. (See two pics below.) Sorry, Iceland, still love you. (second largest in Europe) where I was not allowed to take my rental car. Driving along I looked over and unexpectedly see the Mýrdalsjökull glacier peaking out. 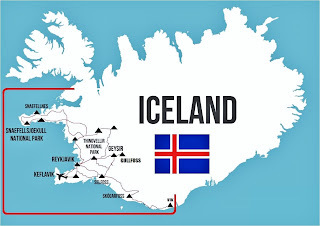 Nearly one-tenth of Iceland is covered by a huge ice cap named Vatnajökull. This photo from my airplane window shows (probably) the Skeiðarárjökull glacier draining out of Vatnajökull. During a breakfast in south Iceland, I looked out the window and saw what had been obscured by clouds on previous days: Massive Eyjafjallajökull, the now sleeping source of the huge 2010 eruption that wrecked havoc in Iceland (and disrupted flights for weeks around the world).